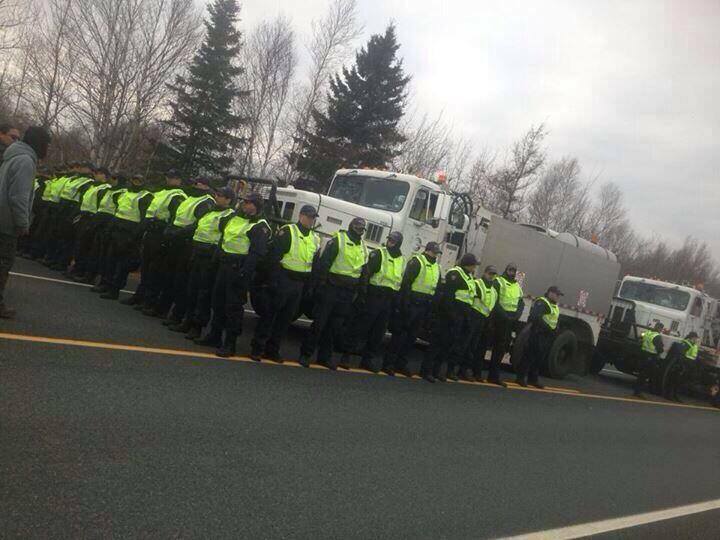 RCMP surround “thumper” seismic testing vehicles contracted by SWN Resources, Nov 14, 2013. SWN Canada has just been granted a one-year extension on licenses they have to look for shale gas in New Brunswick. The company’s licenses were set to expire today, but the New Brunswick government granted SWN Resources permission to extend their search. “While a license to search gives the holder rights to the area in question, it is subject to government’s proposed moratorium on hydraulic fracturing. The moratorium will remain in place until our five conditions are addressed and the risks to our health, water and environment are fully understood,” says Energy and Miners Minister Donald Arseneault. Shale gas proponents say they’re not surprised licenses have been extended, citing legal concerns on the province’s end and other concerns for SWN. “I’m sure they’re just as pleased not to take this project off the books that they’ve been selling to shareholders for the last four years,” says Jim Emberger of the New Brunswick Anti-Shale Gas Alliance. However, Jim Emberger says the moratorium will certainly last longer than the length of this license renewal. “It’s going to take years, so there’s no possibility of saying next year shale gas is okay, if they do that’s a political decision and has nothing to do with good public health,” says Emberger. SWN Resources did not respond to a request for comment from CTV News. Posted on March 17, 2015, in Oil & Gas and tagged anti-fracking New Brunswick, fracking, Mi’kmaq, natural gas, SWN Resources Canada. Bookmark the permalink. Leave a comment.